Naomi Hirahara joins an exclusive club — Vroman’s Walk of Fame. 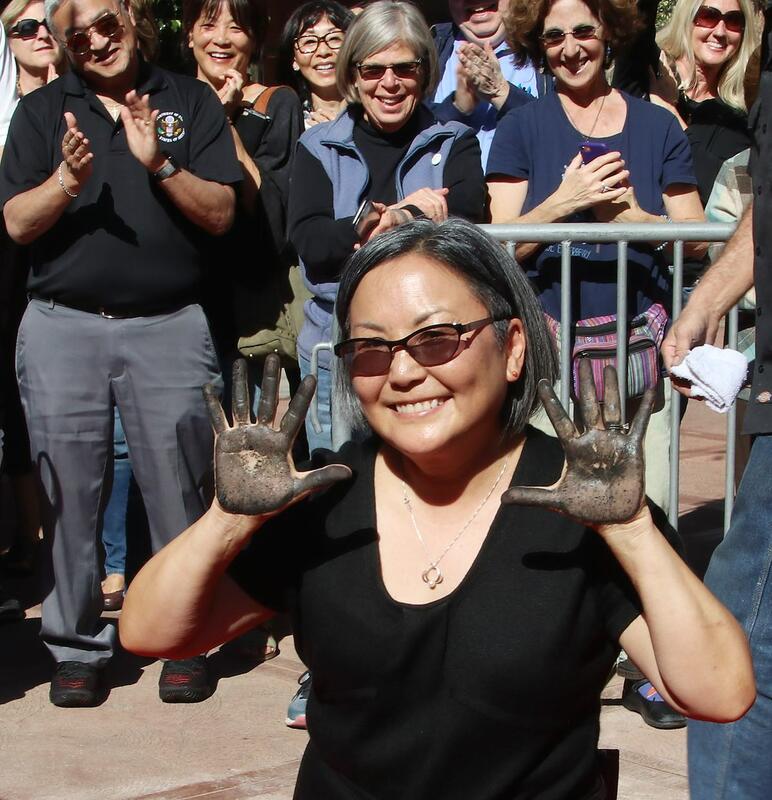 Naomi Hirahara holds up her hands after planting them in cement for Vroman’s Walk of Fame ceremony. PASADENA — The atmosphere in front of Vroman’s Bookstore in Pasadena last Saturday afternoon was reminiscent of a Hollywood paparazzi fest. 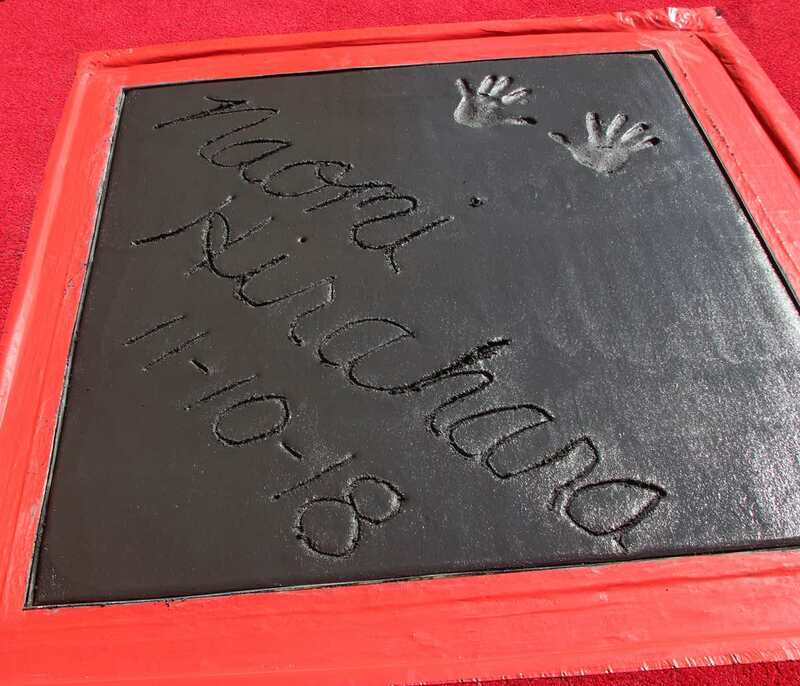 With dozens of well-wishers taking photos and videos, local mystery author Naomi Hirahara placed her hands in cement and signed her name to become a part of Vroman’s Walk of Fame. Inspired by Grauman’s Chinese Theatre’s Hollywood Walk of Fame, Vroman’s Walk of Fame was established in 2014 in commemoration of the bookstore’s 120th anniversary. Hirahara joins fellow authors Lisa See, Michael Connelly and Luis Rodriguez in being selected for this honor. After the ceremony, Hirahara was interviewed on-stage by journalist Nancie Clare in the bookstore’s courtyard. The author was asked how she balances her fiction and non-fiction writing. 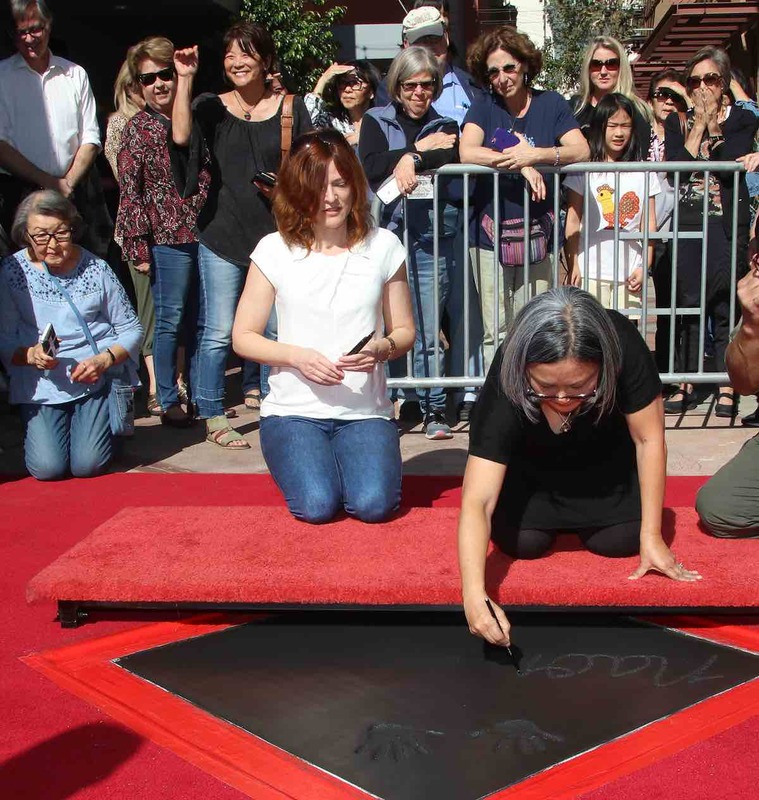 Naomi Hirahara writes her name and the date in cement during Vroman’s Walk of Fame ceremony. In all of her works, Hirahara is committed to telling the Japanese American story. “I think a lot of our community’s history was erased … People weren’t encouraged to tell their stories, so it’s been hard to process it. So I feel like I had to bring Mas in, the gardener. On the difference between writing fiction and non-fiction: “Our passion for the facts, to get that one name right, to get that date … we could pour that into our nonfiction. Whereas I think with the fiction we need to let go. I mean because I’ve done the research already, I could kind of let some of that go and just get to the characters and the feeling and relationships and the narratives. “That’s what really pushes fiction, and so much of it’s a reflection of all facets of ourselves, and that’s why the writing, as we get older, has the capacity of even getting better because we have more experiences … That’s why getting out of our offices and our houses and talking to people and listening to them is so crucial because — I’m not saying we’re stealing their stories, or maybe I am — it is informing us and widening our perspectives, and that we could integrate into our fiction. Hirahara gave an update on a big-screen Mas Arai adventure. “This is an independent project and there’s a wonderful script that’s been made and the creative team so far, the director and screenwriter, I think they really have a vision for it. Hirahara joins other local authors on Vroman’s Walk of Fame, which was inspired by the one in front of Grauman’s Chinese Theater in Hollywood. Although there was a danger that some readers might think that her characters represent her real family, Hirahara said it was important to her as a writer of color to have her voice heard. “It can be really invasive … For writers, we have that risk of people being critical of our work and even our own personal lives. So I think that’s one hurdle. But then from the outside point of view, during that particular time there weren’t that many stories, especially mysteries, of people that were Asian American other than Charlie Chan, that type of thing. So I think those were things to break through. Hirahara’s next mystery takes place in the multicultural setting of Hawaii, specifically Kauai. “The finishing of the [Mas Arai] series was momentous thing and I needed something a little lighter. So that’s why I pitched a new series and it’s the story of Leilani Santiago. She’s Filipina, Japanese and white … Her family owns a shave ice business. She’s young. She’s distantly related to Ellie Rush, so it’s a way of bringing in Ellie, hopefully, in a future installment. Saturday, Nov. 24, from 11 a.m. to 12 p.m. at Chevalier’s Bookstore, 126 N. Larchmont Blvd., Los Angeles. Honorary bookseller for Indie First/Small Business Saturday. Sunday, Dec. 16, at 4 p.m. at Vroman’s Bookstore, 695 E. Colorado Blvd., Pasadena. Special Holiday Market produced by the Journal of Alta California.